The Berlin Wall (German: Berliner Mauer) was a barrier that divided Berlin from 1961 to 1989, constructed by the German Democratic Republic (GDR, East Germany) starting on 13 August 1961, that completely cut off (by land) West Berlin from surrounding East Germany and from East Berlin until it was opened in November 1989. Its demolition officially began on 13 June 1990 and was completed in 1992. The barrier included guard towers placed along large concrete walls, which circumscribed a wide area (later known as the “death strip”) that contained anti-vehicle trenches, “fakir beds” and other defenses. The Eastern Bloc claimed that the wall was erected to protect its population from fascist elements conspiring to prevent the “will of the people” in building a socialist state in East Germany. 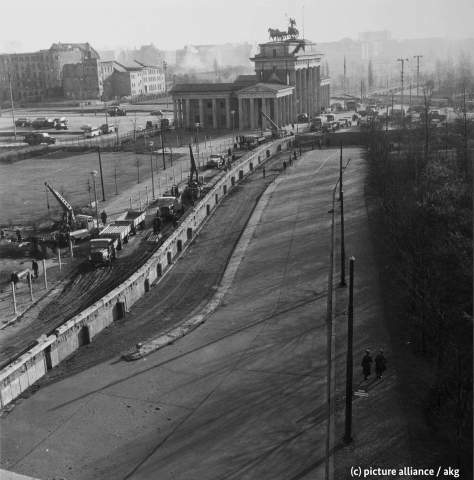 In practice, the Wall served to prevent the massive emigration and defection that marked East Germany and the communist Eastern Bloc during the post-World War II period. 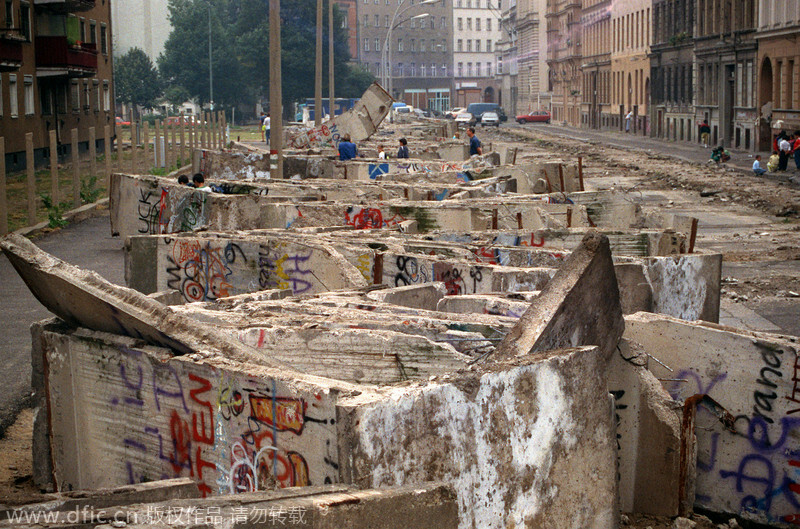 The Berlin Wall was officially referred to as the “Anti-Fascist Protection Rampart” (German: Antifaschistischer Schutzwall) by GDR authorities, implying that the NATO countries and West Germany in particular were “fascists.” The West Berlin city government sometimes referred to it as the “Wall of Shame”—a term coined by mayor Willy Brandt—while condemning the Wall’s restriction on freedom of movement. Along with the separate and much longer Inner German border (IGB), which demarcated the border between East and West Germany, it came to symbolize the “Iron Curtain” that separated Western Europe and the Eastern Bloc during the Cold War. Before the Wall’s erection, 3.5 million East Germans circumvented Eastern Bloc emigration restrictions and defected from the GDR, many by crossing over the border from East Berlin into West Berlin, from where they could then travel to West Germany and other Western European countries. Between 1961 and 1989, the wall prevented almost all such emigration. During this period, around 5,000 people attempted to escape over the wall, with an estimated death toll of from 136 to more than 200 in and around Berlin. In 1989, a series of radical political changes occurred in the Eastern Bloc, associated with the liberalization of the Eastern Bloc’s authoritarian systems and the erosion of political power in the pro-Soviet governments in nearby Poland and Hungary. After several weeks of civil unrest, the East German government announced on 9 November 1989 that all GDR citizens could visit West Germany and West Berlin. Crowds of East Germans crossed and climbed onto the wall, joined by West Germans on the other side in a celebratory atmosphere. Over the next few weeks, euphoric public and souvenir hunters chipped away parts of the wall; the governments later used industrial equipment to remove most of what was left. Contrary to popular belief the wall’s actual demolition did not begin until Summer 1990 and was not completed until 1992. The fall of the Berlin Wall paved the way for German reunification, which was formally concluded on 3 October 1990. The East German (GDR) history is for me most interesting as I do own the most comprehensive and complete passport collection when it comes to GDR passport history. The earliest passport I have is from 1953 plus I hold the diplomatic passport of Günter Mittag (8 October 1926–18 March 1994), German member of parliament, secretary of the Socialist Unity Party of Germany (SED), and a central figure in the German planned economy since 1958!